There always seems to be one more loaf of bread to make. If I had the time, and sizeable pants. I would happily be making a different type of bread 7 days a week. Unfortunately (or fortunately) I don’t have that sort of time and my pants aren’t that stretchy. So if I have a bready idea I usually have to sit on it until we are out of bread again or a suitable meal comes up that we can accompany the bread with it. Frugal Friday seemed like a good accompaniment. A simple salad and a wedge of bread. This little number was a normal white sourdough. The potatoes I had cooked half way through while I had one tray of biscuits in the oven and the second tray being free. Sourdough folded once before popping into the fridge, for an overnight ferment. During the fold, 2/3 of the cooked potato were folded through, leaving aside the remainder 1/3 for the next day. Also adding 1/2 the rosemary roughly chopped again. When it came to shaping time the next morning, rolling out a short fat snake shape and loosely spiralling round. Lightly pressing in the remaining potato and roughly chopped fresh rosemary. Allow for another prove, approximately 1 hour, a good grind of sea salt all over the top of the dough. Then popping it into the oven at 250C, with steam. Bake until golden and hollow sounding when tapped on the bottom. 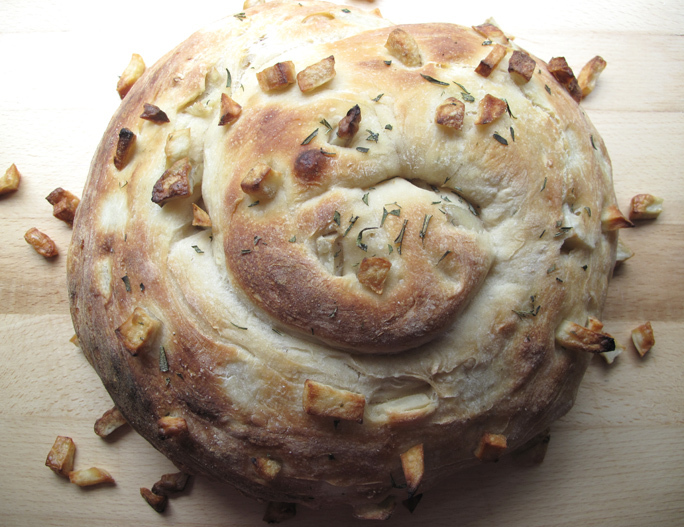 This entry was posted in Baking Bread, Making, Creating + Frugal Living and tagged budget meal, food, frugal cooking, potato and rosemary bread, recipes, sourdough by cityhippyfarmgirl. Bookmark the permalink. Classically good combination of potato with rosemary and I’m loving the thought of the ol’ sea salt hitting the tastebuds and then teaming it all up with a crisp salad. What a great meal. Oh and Bry-dieeeee, my kitchen is almost set up. LET THE GAMES BEGIN! *distant trumpet*…kitchens are now open! You make such wonderful bread! I love that exuberant seashell look with potato popping out 🙂 If you want different breads but still keep the same pants (!) then maybe try your basic sourdough, add different ingredients and make rolls which you batch bake in a sort of flower arrangement. Nope that doesn’t come across in words does it? I’ll have to find a picture and email you what I mean. Thank you. Coming from the bread master, I take that as a huge compliment! Sizable pants, LOL! I know what you mean! This bread looks great. Adding to my “to try” list. Which is also quite “sizable”. I’d love to know how you go if you make it. 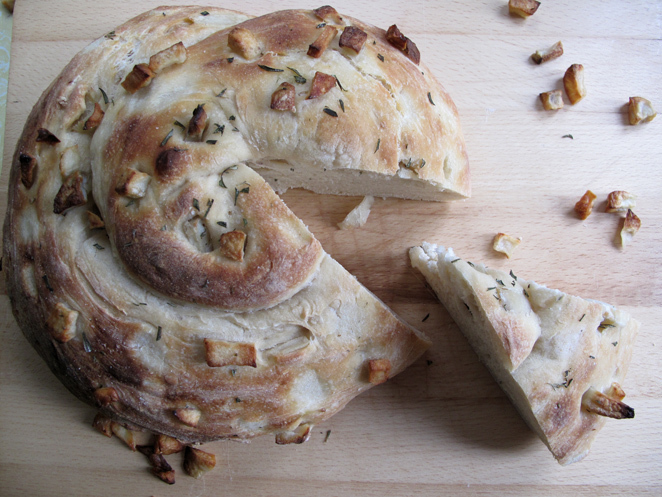 that is amazing- I’ve been thinking about potato and rosemary bread for the last week! Almost worth a new pair of pants. It’s just a happy combination isn’t it. The Monkeys wouldn’t touch it though, picked all the potato out…(I know, strangely odd children that don’t like potatoes.) Happily eat hommus, dark chocolate and brie, but not potatoes. Seriously, you make the most wonderful looking breads! Oh that looks so yummy. I’m inspired! Looks fab. I love the combination of potato and Rosemary…even as a pizza. Oh yeah…, nice one. Feel the same way about bread, could include it in every meal, but not sure I could keep up with my wardrobe if I did that.